Next year’s dates: the Vanuatu Open Water Swims in Port Vila on 28 May 2016, and Espiritu Santo Swim Week from 30 May through 3 June 2016. Early June we escaped the Canberra sub-zeros and 3 hours eastwards sky-bound, landed in the capital of Vanuatu, Port Vila, with some trepidation. Black Friday March 13 Cyclone Pam ripped the guts out of a select number of Vanuatu tropical isles, and Efate where the capital holds fast was one such isle. Foreign Affairs had since Pam, been issuing do not travel advisories but then shifted to a cautious approach. Thus we stayed the course. Most of the time we would be on the northern island of Santo which escaped unscathed. Tourism is the main stay with limited agriculture, cattle raising and financial services (international tax free haven and shipping flag of convenience). 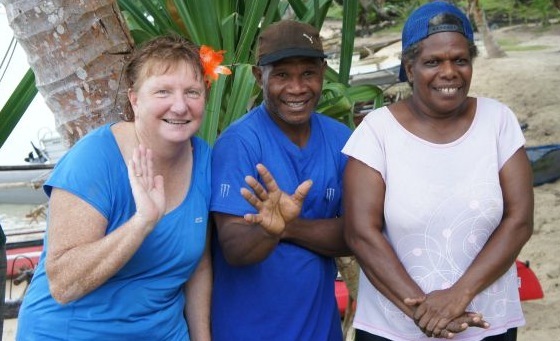 Vanuatu has had intermittent colonisation attempts back past a thousand years ago, strange recent 70-year dual French-British Condominium Rule until independence, huge diversity of languages, complex and highly variable social heirachical and spiritual systems, and all of this among some 65 inhabited islands. Amidst our group was the former Australian High Commissioner whose watch fell across the 1980 independence milestone. To add to this intrigue, is that Vanuatu is at the confluence of intense volcanic and tropical cyclonic activity. First-response aid in the aftermath of Cyclone Pam came in the form of bottled water, clothes and tinned food, of which participants at a South Pacific Post-Disaster Forum told me was not what was primarily sought, rather the permanent repair of roofs and scarce timber for rebuilding homes and schools. The Aussie and Kiwi Armies did great they say – deploying temporary tarpaulins in particular for schools and public buildings. We spent as much time as we could outside of the organised tour agenda, eating at local markets, visiting the National Library, the Town Library, National Cultural Centre, Parliament House, key spiritual places, walking the colonial precincts, our High Commission and places where many locals live in modest dwellings. Having brought snorkels and flippers we squeezed in as many watery adventures as possible. You get a sense that the soul of Vanuatu is lost and the search for a Vanautu identity continues. The rich flora and marine life is being ravaged (fauna is limited) and an “emerging national power” has come into the fray exerting influence. During our time in this place, a new Prime Minister came to power, having the week before been sacked as the Foreign Minister – though few locals seemed to know. Thank goodness for the BBC – even my old stamping ground of Radio Australia was absent without leave. Yeah – but what about the Swimming…. Well nearly all local people do not swim – though many take to the water for daily fishing. 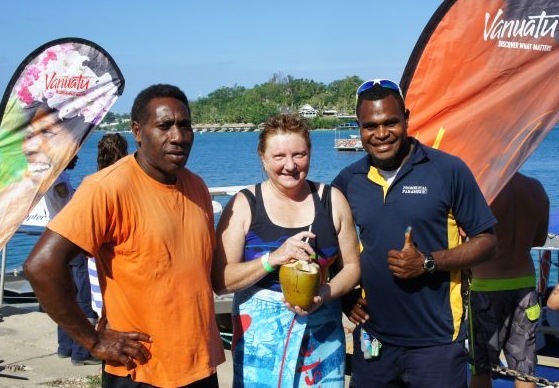 The 3.5 km Vanuatu Open Water Swim in Port Vila Harbour on 6 June circumnavigated Iririki Island. About 100 swimmers I suppose lined up for a deep water start then with smiles beaming we skirted our way between moored and shore-wrecked boats, extensive patches of sea urchins, local support paddlers and returned into a glaring sun to complete a becalmed sea journey with a good sense of satisfaction. I was desperate to pick up one of spot prizes, left as the final picking:- Atlas du Vanouatou by Patricia Siméoni. … and the French author was at the signing table! But alas. Try as I did, there were evidently few publications on matters local or national aside from the V Daily Post. During the remainder of the week in Port Vila we enjoyed several satisfying informal swims around Efate. The following week – Espiritu Santo Swim Week on Vanuatu’s northern island – was quite something else. 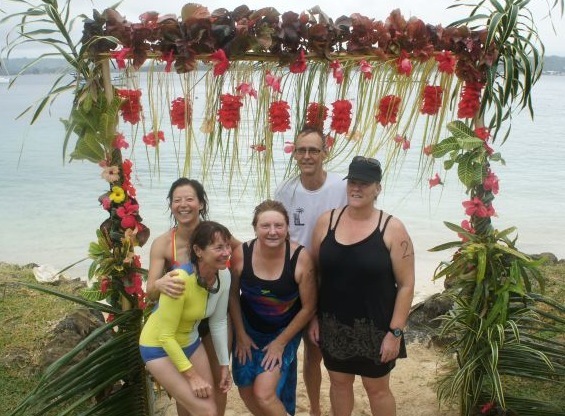 The main event, the Espiritu Santo Aore Swim on 10 June was a 3.5 km channel swim from Santo’s capital, Luganville, across the Segund Channel to Aore Island Resort. Bloody hell.. I thought I was was going to drown. The first half of the channel was white caps, I found myself isolated despite efforts to establish landmarks and pre-event course surveillance and current “mapping”. Just when ready to raise arm – to my great relief – there out of no-where was this Ni-Vanuan on his paddle boat who promised to stay with me for the remainder. And then just at this point – like magic – the white caps disappeared and a flattened surfaced allowed me to start extending, breathing became more controlled and both sides, and with hip rotation. I gradually settled into a sustainable pattern and thought – geez – I escaped a bullet here. But guess what? The white caps had been abated by the… channel tide.… that swept many of us down stream of the finish banner, adding much to an already exhausting swim. It seeming took forever to drag myself to shore. Later when land-based I reconnected with my Ni-Vanuan support paddler and his wife to much hugging and laughter. To a more relaxing theme – and in keeping with the remainder of the week on Santo, the informal swim excursions to Champagne Beach-Lonnoc Bay and Port Olry were simply gorgeous. The snorkelling outside our Aore Island resort was stunning, even spotting a dugong and turtles. I’m looking forward to my next Pacific Swims and hope some club members come with me. See Ocean Swim safaris for images and a wrap of the events.